The common names of most Lepidoptera subfamilies are derived from the adults not the Caterpillars. Swallowtail refers to the posterior extensions on the hind wings of some species. Birdwing refers to the large wingspan of members of the Troides genus. The butterflies of PAPILIONIDAE generally lay their eggs singly on the undersides of young leaves of the foodplants. 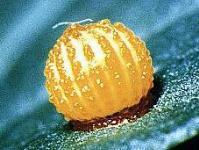 The eggs are usually spherical and cream coloured. The Caterpillars of this family are very highly evolved. They live in the open. Many when disturbed rear up on their prolegs, and briefly evert a brightly coloured pair of fleshy horns (the osmeterium) from the top of the junction of the head and the protothorax. Simultaneously they emit a strong smelly secretion. In addition the body is also protected by paired fleshy processes. These processes tend to conceal the head which is then less distinct, and so less vulnerable. The Caterpillars pupate on the food plant, usually with an upright pupa resting on and secured at the bottom with a pad of silk and cremaster, and by a central girdle of silk.